About 2012 – Constable BV. At sunrise on December 21, 2012 for the first time in 26,000 years the Sun rises to conjunct the intersection of the Milky Way and the plane of the ecliptic. 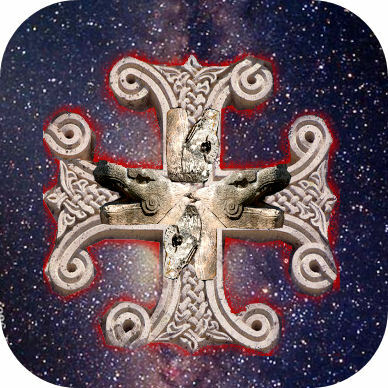 This cosmic cross is considered to be an embodiment of the Sacred Tree, The Tree of Life a tree remembered in all the world’s spiritual traditions. 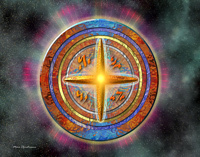 Some observers say this alignment with the heart of the galaxy in 2012 will open a channel for cosmic energy to flow through the earth, cleansing it and all that dwells upon it, raising it all to a higher level of vibration. The galactic alignment is a core idea in many of the world’s spiritual traditions-especially The Mayas, The Toltecs, The Hopis, Mithraism (The predecessor of Christianity), the Vedic Yuga doctrine, and Neoplatonic philosophy, all the way up to William Blake. Time is accelerating. 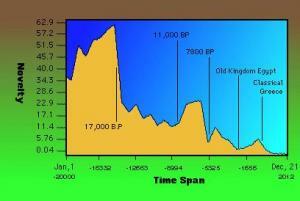 Events that took centuries to take place now take years. Calculations that would have taken decades are now made in minutes. The Internet enables communication that used to take months to happen in seconds. In almost every area of life, change is occurring faster and faster. So where is all this leading? Some people think we are headed toward what is called a “singularity.” This is the term that mathematicians give to a point when an equation breaks down and ceases to have any useful meaning. A singularity in mathematic arises when we divide by zero. In the old mathematics this was impossible but in the current state of mathematics a singularity is simply a hole in the “space/time of numbers”. If we look at the current ideas of time numbers represent an event and all the events are represented by a highly symmetrical structure “the hyper diamond“. This Diamond also called the Hall of Mirrors represents all the Possible Paths we can take in the Multi-Verse. Time is speeding up because the Amount of Events per Time-Unit is speeding up. The speeding up is not a linear proces. It follows a Power-Law. When a Power Law is active Speed is Speeding Up (Spiraling). At a certain moment the Spiral will move into the Singularity. Mathematical Space contains many holes and we are able to navigate avoiding the holes. There is one very special hole. This hole represents the Primal Void, the Emptiness before any thing was created. Some people call this state God. According to the Physicist Leshan we can use this hole to Travel Time and Space. Perhaps we will reach the Hole of Leshan in 2012. In the weird experiments of John Neumann with a Tesla-Time machine 2012 showed itself as a Time-Wall. The experimenters could not pass this wall. The Experiments of the Psychologist Helen Wambach showed the Same Pattern. Wambach used Regression Therapy to move thousands of people into the Future. It was impossible to jump to the period surrounding 2012. To her surprise many people predicted the same thing. Before 2012 the world will be hit by intense events like the collapse of the banking system, major conflicts, major earthquakes and spectaculair weather-events. The idea that humanity is heading towards a point of infinitely was explored by Teilhard the Chardin (Point Omega) and in recent times by Terence McKenna in his book The Invisible Landscape. He calls this point Timewave Zero. McKenna developed a mathematical Fractal Function, which he called the “timewave”, that appeared to match the overall rate of ingression of novelty in the world. “Ingression of novelty” is a term coined by the philosopher Alfred North Whitehead to denote new forms or developments coming into existence. This timewave is not a smooth curve, but one that has peaks and troughs corresponding to the peaks and troughs of the rate of ingression of novelty across human history. The most significant characteristic of McKenna’s timewave is that its shape repeats itself, but over shorter and shorter intervals of time. The curve shows a surge in novelty around 500 BC, when Socrate, Buddha, and Pythagoras created a new Religous Paradigm (“Know Thyself“). The repeating nature of McKenna’s timewave shows the same pattern occurring in the late 1960s, where it happened sixty-four times faster. In 2010, the pattern repeats again, sixty-four times faster still. At December 22, 2012 the timescale is compressed from months to weeks, to days, tending very rapidly toward zero: a point McKenna called “Timewave Zero.” At that moment we have ended our evolutionary journey and will jump to a new state. According to new mathematical models (the Ternary Numbers) and new insights in physics (String Theory) we will re-connect to the Super Mind that created our Universe and re-connect to the invisible parallel universes that started the same time our Universe was created. We will be able to communicate with all the isolated souls that exist in many disconnected time-lines in many disconnected universes. The time between now and 2012 will be a time when many old Institutions will Die. We can see this already in the Banking Industry. They will be unable to handle the increasing amount of vital events. In this time frame we will also experience strange Weatherpatterns and a Restructering of Nature. I hope you can imagine that all the structures we have created will collapse at a certain level of change. The only way to survive will be a state of “Martial Law”. This exactly what the US Time Travellers of Helen Wambach are predicting. If we accept the idea of the Singularity, Point Omega or Time Wave Zero there are two choices. The first choice is to withstand the pressure and stay on Earth. The other choice is to Unite the Opposites, Move through the Hole of the Primal Void to our Complementatry Universe (Heaven, The Kingdom).The last choice is only possible if we Know Our Selves. “But I say unto you that the Kingdom is Within You, and it is among you. When ye come to Know Yourselves, then others will know you, and ye will know that ye are all children of the living Father. But if ye will not know yourselves, ye dwell in poverty and ye are yourselves that poverty” (Gospel of Thomas, Logion 3). “When ye make the Two One, and when you make the Inside like unto the Outside and the Outside like unto the Inside, and that which is Above like unto that which is Below, and when ye make the Male and the Female one and the same, …..then will ye enter into the Kingdom.” (Gospel of Thomas, Logion 22). In the language of the Toltecs we have to fool the Eagle to get at the other Side. After we Die The Eagle “eats our experience” and brings us back to Earth without a memory of what has happened. The Eagle creates a Veil that covers the “real world, the World of the Senses”. 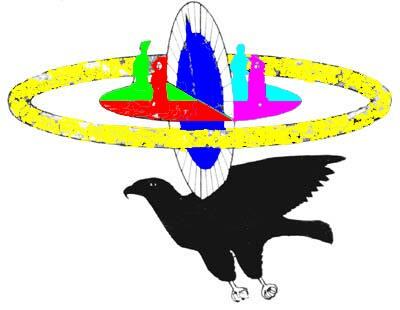 There is a Pathway to Pass the Hole of the Eagle and Leave 3-Dimensional space. To pass the Eagle we have to forget our Experiences and become Innocent again. When the Amount of Events increases we will reach a point where the Senses will simply collaps of the huge amount of Stress. Between Now and 2012 we have to make a choice. We can go on to the bitter End (The Apocalyps) or we can use our Consciousness, the Gift of the Great Spirit. Next Next post: What Terrence McKenna forgot to Look at: The Final Explanation of what is Happening in 2012?